With profound regret we learned of the death of Thierry Delcourt, Director of the Department of Manuscripts at the Bibliothèque nationale de France, on November 22. The cause was brain cancer; he was 52 years old. The Digital Library of Medieval Manuscripts at Johns Hopkins could not have had a better friend and collaborator than Thierry Delcourt. It is no exaggeration to say that without his vision and generosity, our site would not have the wealth of manuscripts of the Roman de la Rose it now contains. This is how it happened. In 2006, Winston Tabb, Dean of the Sheridan Libraries at Johns Hopkins, and I visited Thierry Delcourt, the newly appointed Director of Manuscripts, in his office on the Rue de Richelieu. We had come to Paris in hopes of obtaining imaging rights to ten or twelve key Rose manuscripts in the BnF. When I explained our project, and showed him the site, Thierry smiled and asked if we wouldn’t rather have the image rights for all the Rose manuscripts in France! Quickly calculating how much of a grant we would need to make this happen, we agreed that Hopkins would raise the necessary funds for the project, while the BnF would assume responsibility for the digital imaging of the 140+ publically-available Rose codices in France. And so began a wonderful collaboration born out of Thierry Delcourt’s visionary conception for the role of the BnF in the twenty-first century. His vision grew naturally from his own training in and love for medieval French literature. Trained as a paleographer-archivist at the prestigious École des Chartes in Paris, he specialized in manuscripts of the prose Tristan cycle, beginning with his thesis: Le Roman de Tristan en prose. Édition critique et commentaire de l’épisode du Château des Pucelles (1983). He subsequently published other books on the Prose Tristan, on Arthurian literature, bestiaries, crusade chronicles, and the tradition in France of early popular book formats. Early in his career, Thierry Delcourt distinguished himself as an imaginative and entrepreneurial administrator both in the public and private sector. Appointed Conservator of the Audio-Visual Department at the BnF in 1983, he was recruited into the private sphere as a consultant in systems technology from 1989 to 1992, the year the BnF lured him back to his former post. In 1995, he became director of the Municipal Library of Troyes, which, under his leadership, became one of the leading media centers in France…even, some feel, one of the most modern and innovative of its kind. In 2006, the BnF appointed him to the post he held until his death this week. Fate did not allow us to prolong our partnership with Thierry himself beyond five-and-a-half short, but wonderfully collegial years. With uncanny prescience, however, he leaves as a legacy an extraordinary team in the Department of Manuscripts and its Information Technology section at the BnF with whom we will continue to collaborate bien amicablement thanks to our shared memory of Thierry Delcourt. 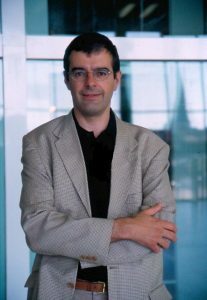 Thierry was a wonderful human being and will be missed in the digital humanities community. I consider myself lucky to have worked with him for the past few years. Thanks for you nice tribute to my brother.